Well the day has finally come. A day I thought could never happen, even in my wildest dreams, and believe me, I’ve had some wild ones. It all started last year while in the Public Theater’s Emerging Writers Group, I wrote a play called Red Flamboyant, partially inspired by an article in the NY Times about a woman named Pham Thi Hue, who in her early 20s was infected with AIDS. She decided to start a support group to help other people living with AIDS. In America this would be considered a brave and even noble thing to do. 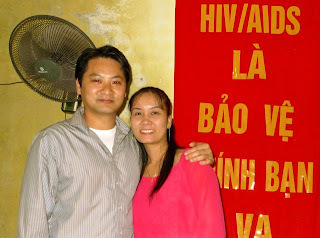 In Vietnam, where people living with AIDS are still discriminated against and even shunned by their own families, starting an HIV/AIDS support group is like being the only one on the battlefield that yells out “I am Spartacus.” Well, today I meet Spartacus. It was the second day of being in Vietnam that my dad told me my cousin Duc had found Mrs Hue and had made contact with her. She agreed to meet with us but was trying to pin down a date. There was a lot of back forth, rescheduling and cancelling tour dates to accommodate Mrs Hue’s busy schedule. At one point I had kind of given up on meeting her. It seemed like every time cousin Duc called, he only had more bad news for us. More setbacks. We even had to rebook our flight to Haiphong because of a last minute change from Mrs Hue. It seems meeting Spartacus comes with it’s own challenges. Finally we settled on Saturday, a day before my birthday. 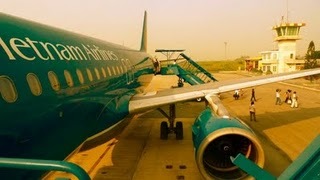 We start off with a 6am flight to Haiphong. At the airport, my dad and me go over notes and interview questions I had prepared the night before. The sign gives me some hope. We made it this far. Even if we were to turn back now, I’d be happy, just seeing this little gated storefront with the sign above it. It made everything much more real for me. Finally my dad is able to reach Mrs Hue and she says she’s on her way. Gulp. Really? She’s really coming? Crap. Thankfully my dad is there to translate. But I really wish I could speak freely with her. At that moment I yearn for three more months and a Rosetta Stone Vietnamese language pack. I hear several motorbikes pull up. A young and tiny Vietnamese woman takes her helmet off and her long hair falls to her shoulders. I recognize her from the photo in the NY Times article. It’s her. It’s Mrs Hue. She nods at me. We only make eye contact for a split second. She’s just as nervous as I am. There’s another lady with her and some children. But we’re not introduced, yet. Mrs Hue unlocks the gate and opens the door. She leads us in, still not saying anything. She leaves us in the main room as she opens up the back office. We look at all the pictures and signs on the walls. There’s a bright red banner on the inside that reads the same as the exterior sign. “Haiphong Red Flamboyant.” Whereas the exterior sign is subtler, less declamatory, the banner inside is more striking, more…flamboyant. Now we’re in the back office. Some of the kids run through and she tells us they are some of the orphans that the group takes are of. We’re lead to a small brown leather sofa in one corner. There’s bottled water waiting for us. My dad is surprised by this gesture and it impresses him. We all sit down. I look at my dad and he just looks at me. Great. I usually can’t get him to shut up about anything, and now he chooses to clam up. So I say to her in my very broken Vietnamese, “Hello Aunt Hue.” Calling someone an aunt even though they’re not related to you is a sign of respect. I continue. Like a tourist, I say “I’m sorry. 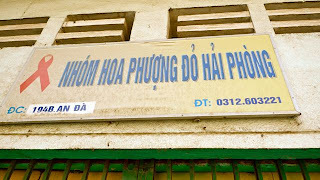 I don’t speak much Vietnamese.” She nods. “This is my mother and father. My father will be translating for us.” She nods. I start to ask her some questions. “Can you tell us a little about yourself, before you started the group? What did you do for a living? Did you go to school? Etc.” Mrs Hue nods and says she would rather print out an article written about her that answers all of that. It’s all in Vietnamese, so I’ll have to wait for my dad to translate it for me. Next question. 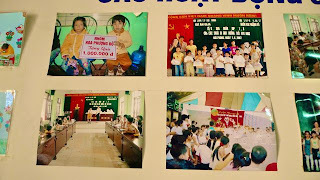 “How big is the group now?” There are roughly over 200 hundred adults in the group, and another 200 orphans. Some orphans live with the group, but most live amongst the members and are given a stipend. The cost of caring for one orphan is about $10 a month. “How does the group support itself?” They still get no money from the government. Most of it is through foreign aid as well as members selling items. In addition to the group, Mrs Hue runs two businesses. A clothing business that makes and sells shirts, scarves, socks, etc. And a boating business where they catch and sell seafood. Some other notes from the interview: The group will go to houses to pick up the dead. They are not allowed to bury them in the cemeteries, so most are cremated. She shows us a picture of a dead woman lying on the bathroom floor. The family had shunned her and kept her there until she passed. The group gathers daily, but they usually have a big party every 10th of the month. We asked what the significance of the 10th was. She says the group was formed on the 10th day of the month. I tell her, in my play, the group performs and the Mid Autumn festival. I ask if she sings. She says yes, and adds that the group sings songs about AIDS and they even compose their own music. She says she’ll mail me a CD of the music! Then she sings for us. It’s beautiful and I’m overjoyed I’m able to capture the moment on video. We take several photos together and she puts her arm around me. My dad poses with her as well. I ask her if she had any questions for me. She simply says she wants to read my play. Once it’s been translated into Vietnamese. My dad says he will do it. She tells me I need to learn Vietnamese so we can continue talking to each other. Rossetta Stone, here I come. The visit comes to an end. We exchange phone numbers and email addresses. I give Mrs Hue a card with a small donation inside. She calls for a taxi to take us to a bus for Hanoi. She tells us when she heard someone had written a play about her she very was honored and moved. We continue to wait in the main room and I ask to see some samples of the t-shirts and other clothing they sell. I end up buying a few shirts and Mrs Hue gives my mom some bed slippers she made. Her assistant waits with us. She’s young and smiles a lot as well. Mrs Hue tells us she’s recently widowed. Her husband killed himself after learning he had given her AIDS. The taxi arrives and we get in. Mrs Hue takes by the arm and leads me to the taxi. Mrs Hue, her assistant, the orphans, and another family all wave goodbye to us. It feels like leaving family. No, I will not forget you Aunt Hue. Not I, nor my parents, nor anyone I come into contact with. Oh how absolutely wonderful. I am so happy for you and your family to have had to meet Mrs. Hue. Makes one have hope.